Effective learning requires time, comfort and peace, so it is impossible to combine study and employment. Study and employment distract one from another. To what extent do you think the statements are realistic? 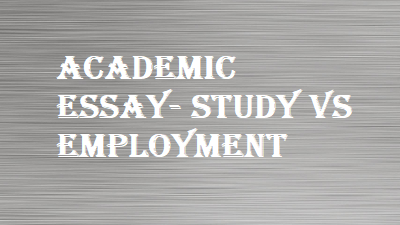 Support your opinion with examples- Study Vs Employment. Amidst an array of technological advancements, the present generation is one which bears witness to an ever-evolving world with highly advanced industrialization and economic progress. It is then obvious that the demands of the industry on the youth of today is tenfold higher than what it was 2 decades back and the rise of the costs of higher education is still a looming problem. Perhaps this is the reason why people try to combine their studies and get employed at the same time, a practice which can prove to be very detrimental to one’s success. Effective and smart learning requires commitment and perseverance, something one cannot give when him/her is burdened with other things such as employment. This is especially evident when it comes to demanding jobs. The pressures of one’s employment haunt his/her will to study. This can lead to a number of problems where the entire plan may fail. One may create problems at work due to studies by not paying enough attention. Or one may not give enough attention to work attracting attention from the employers. Or worse still, one may completely mess up both work and studies, effectively doubling the problems he started with. Moreover, the proper and clear-cut study requires comfort and peace of mind, something that cannot be attained when one is constrained by the pressures of work. Most lines of work these days require a good amount of dedication and adherence. This would overshadow the requirements of academic work and will be a sure shot recipe for failure. Financial conditions of someone would press them to combine working and studying. However, in light of this being detrimental to one’s success, one must understand that the human mind is not for extensive multitasking. We can only focus and succeed in a single thing if we put our minds to it, not multiple things. Hence, it is fairly safe to conclude that employment and academics are not things that go together. Sure, the prospects of earning and learning at the same time might sound like a deal maker but it will only lead to one’s downfall. There are multiple loan options for the needy and financially unsound. Therefore, it is absolutely critical that one sets his mind on either academics or work and not both.